In conjunction with the Missouri Farm Bureau, "Thank a Farmer Week", students of the Chillicothe FFA Chapter presented programs to elementary students of the Chula and Chillicothe School Districts about agriculture. The presentation was in relation to where their food comes from and why agriculture is important to them. The FFA members gave a quick overview of where food comes from and then played a few interactive games to challenge what they learned. Thank a Farmer Week is a celebration of the U.S. food supply as provided by America's farmers and ranchers. Within the first two months of the year, the average American will have earned enough income to pay for their annual food supply. It takes until late April to earn enough to pay for local, state, and federal taxes. Of every retail dollar spent for food, 81 cents goes for marketing expenses. This includes processing, packaging, wholesaling, distributing, transporting, and retailing food products. The remaining 19 cents goes back to the farmer who uses it to pay for operating costs in providing raw products for food. The farmer's share is used to purchase farm equipment, fertilizer, fuel, seed, feed and other input costs. Thank a Farmer Week is an appropriate time to "thank a farmer" and educate our youth about where their food comes from! CAPTION: Among the most prestigious awards distributed at last night's annual FFA Banquet and Awards Ceremony were the Litton Awards. 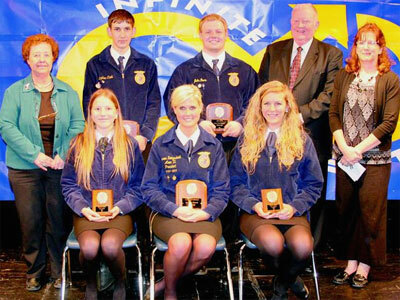 Pictured at front, from left: Michaela Mammen, Litton Livestock Award; Lauren Dietzschold, Jerry Litton Memorial Scholarship; Micheala Simmer, Litton Livestock Award; Back, from left: Bonnie Mitchell, Stephen Cook, Rusty and Karie Black Litton Award; John Davis, Jerry Litton Memorial Scholarship; Ed Turner and Karie Black. 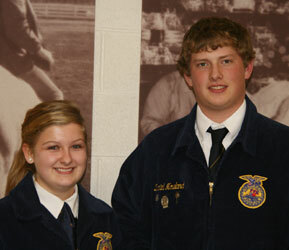 The activities and accomplishments of Chillicothe FFA members were highlighted during the 2011 Chillicothe FFA awards banquet and ceremony at Gary Dickinson Performing Arts Center last night. Approximately $34,200 in awards and scholarships were presented to FFA members during the awards ceremony and three community supporters received Honorary FFA memberships. The top awards of the evening - the Jerry Litton Memorial Scholarships - were presented to John Davis in the amount of $5,000 and to Lauren Dietzschold in the amount of $3,000. The Jerry Litton Memorial Scholarship was started by Mr. and Mrs. Charley Litton in 1979 in memory of their son, Jerry, and is sponsored each year by the Jerry Litton Memorial Family Foundation. The award is presented to a graduating senior who shows evidence of strong leadership potential as demonstrated in FFA, school, and community activities and plans to continue his or her formal education. Foundation vice president Ed Turner presented the awards. The Jackie Skipper Memorial Scholarship was presented to Kelton Diggs in the amount of $500. The award was introduced three years ago in memory of Jackie Skipper, who died in December 2008 shortly after her 29th birthday. Skipper was a community supporter of FFA and was a member of the organization while in high school. The award is to given annually to a graduating senior in the FFA chapter who shows evidence of strong leadership potential as demonstrated in FFA, school, exhibiting livestock and community activities, and plans to continue his or her formal education. Another scholarship that is in its third year was the BTC Bank Leadership Award to be presented annually to a senior FFA member. Winners are selected on their four-year performance in leadership and service to FFA, school and community. This award is a trophy and a $400 check. The award was presented to Carrie Boon. Four FFA members were awarded the Jerry Litton Memorial Leadership Award. Recipients are Haley Thompson, Lynzie Colvin, Jennifer Waits and Devinn Ashford. The Jerry Litton Memorial Leadership Awards are sponsored by Chillicothe Youth Agri-Leaders, Trans Ova Genetics, American Family Insurance (Janet McCauslin Agent), United Country Graham Agency (Dan R. Graham, Broker), Chillicothe FFA Alumni and Josh Quinn Memorial sponsored by DQ Precision Planting and Tillage (George and Marta Quinn). Each recipient receives $660 to pay the expenses to the Washington, D.C., Leadership Conference. The winners' names will be engraved on a plaque, and they will represent the chapter at a week-long leadership conference in Washington, D.C., during the summer. Dani Moore won the Missouri Alumni Washington Leadership Conference Scholarship. The Rusty and Karie Black Litton Award was presented to Stephen Cook. This award in the amount of $500 is presented to a graduating senior in the Chillicothe Chapter in honor of Rusty and Karie Black. The recipient must show evidence of strong leadership potential as demonstrated in FFA, school and community activities. The FFA member receiving this award has exhibited dedication to the Chillicothe FFA Chapter throughout his or her four years of membership. Litton Livestock Awards were presented to Michaela Mammen, Swine, Michaela Simmer, Sheep and Evinne Bowman, Beef. This award is given to students who keep livestock at the Litton Agri-Science Learning Center as a component of their SAE project. Winners are selected by their ability to care and manage their livestock along with work ethic, responsibility and showing. The award consists of $75 and is sponsored by the Jerry Litton Memorial Family Foundation. Three community members were inducted as honorary members in the Chillicothe FFA during the annual banquet. Honorary membership is given to farmers, school superintendents, principals, members of boards of education, chapter advisers, teachers, staff members in ag education and the FFA who have rendered outstanding service by a majority vote of the members present at any regular meeting or convention. This year's inductees are Andy McDaniel, Bret and Darla Davis, and Copeland Construction. New this year was the Dorothy E. Boon Holms Scholarship in the amount of $300 given to a 2011 senior in the memory of Dorothy E. Boon Holms, longtime FFA supporter. The award was presented to Cheyenne Bannan. Two $5,000 AFA scholarships were presented to seniors who are outgoing Chillicothe FFA members. Agricultural Future of America was begun by the Kemper Foundation to encourage young people to go into an agricultural or related career. The local community must raise $2,500 for each scholarship and the Kemper Foundation matches this amount. The student must also agree to attend the AFA Convention held in the Fall in Kansas City, Mo. This year's winners were John Davis and Cassie Reid. 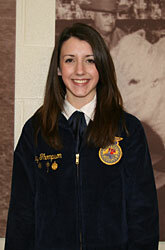 It was also announced that Cassie Reid was awarded an additional $1,000 National FFA scholarship. As in previous years, Thursday's FFA Banquet attracted a large crowd of FFA members and community supporters. 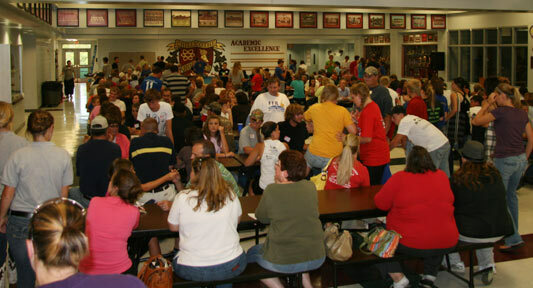 The evening began with a meal served to in the Chillicothe High School Commons. 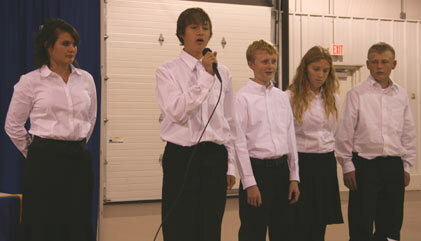 Colton Reeter, senior FFA member, sang about how it was "A Great Day to Be Alive," at last night's annual FFA Banquet. Colton was joined on stage by the rest of the senior class representatives midway through the song. The seniors also presented a slideshow and recognized their parents. This year at the 83rd State Convention, students participated from Chillicothe, Bosworth, and Southwest. The Farm Management team placed 14th and earned a group II rating. 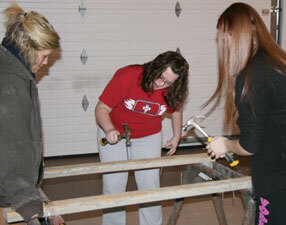 The team included Stephen Cook, Lauren Dietzschold, Maycee Hoover, and Cassie Reid. The Horses team placed 34th, with a group II rating. The team included members Devinn Ashford, Lara Hopper, Dani Moore, and Tanner Thompson. The Parliamentary Procedure team earned a group I rating; the team included Madi Condron, Jordan Huddleston, Bridgett Kieffer, Cyrsten Lollar, Lizzie McCoy, Brooke McCulley (Alt), and Blake Rasummsen. The Ag Issues team placed 2nd and earned a group I rating; the team included Stephen Cook (Tech), John Davis, Cecily Donoho, Morgan Hughes, Phoebe Purtle, Diana Nelson (Tech), Maresa Sykes, Emmy Venner, and Jennifer Waits. In Public Speaking Division II, Caela Ashford received 3rd place and a group I rating. Haley Thompson received a group I rating in Extemporaneous Speaking. This year there was one state winning proficiency award - the winner was Tanner Jones in Fruit Production. Eleven members received their State FFA Degree; those members are Cheyenne Bannan, Carrie Boon, Stephen Cook, John Davis, Lauren Dietzschold, Justin Haddakin, Maycee Hoover, Marie McMahan, Clark Morris, Colton Reeter, and Cassie Reid. During the 83rd Missouri State FFA Convention, the Chillicothe FFA Chapter was awarded four top honors. Those awards given to the chapter were Superior Chapter, 100% Membership, 10+ Member Growth, and Bronze Emblem Awards. To qualify for the Superior Chapter Activity Award, chapters must verify that their chapter members have completed at least one activity related to each of the five quality standards established within the three divisions: Student, Chapter and Community development. The 100% Membership Award is given to those chapters who have a chapter membership roster that is equal to or greater than the number of members of 9-12 students enrolled in the schools Ag Education courses. To qualify for the 10+ Members Growth Award, chapters must show an increase of 10 or more members, in their membership from the previous year's roster. The Bronze emblem award is for chapters that completed and submitted a National Chapter Application on the state level. Selection is bases on major activities described in Form II of the National Chapter Activity Award Application. The top chapters are submitted to the National FFA Organization where they compete for the National FFA Chapter Award. The competition will be this fall at the National FFA Convention in Indianapolis, Indiana. 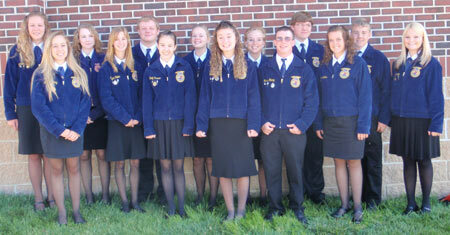 On March 30, 2011, the Chillicothe FFA Chapter participated in the Northwest District FFA Contest. The results are as follows: Agricultural Issues, 2nd place (state) - Cecily Donoho, Phoebe Purtle, John Davis, Jennifer Waits, Morgan Hughes, Maresa Sykes, Emmy Venner, Stephen Cook (Tech), Diana Nelson (Tech); Parliamentary Procedure, 2nd place (state) - Evinne Bowman (Alt), Madi Condron, Jordan Huddleston, Bridgett Kieffer, Cyrsten Lollar, Lizzie McCoy, Brooke McCulley (Alt), and Blake Rasmussen; Prepared Public Speaking Division II, 2nd place (state) - Caela Ashford, Alternate - Tanner Jones; Knowledge Team 6th place - Shantel Cooper (Alt), Quinten Lewis, Faith Peters, Paige Peters, Matt Depuy; Creed Speaking, 2nd place (state) - Elizabeth Warren; Extemporaneous Speaking 2nd place (state) - Haley Thompson. 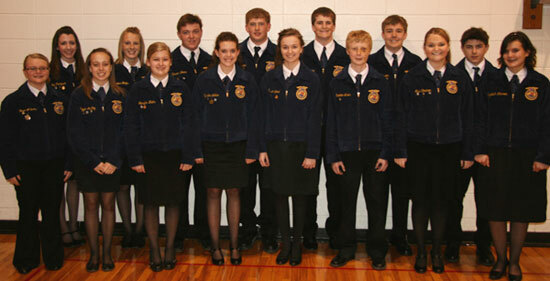 All members advance to the State FFA contest being held in Columbia on April 14 & 15. 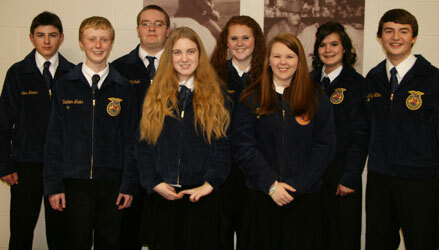 On March 29 and March 30, 2011 the Chillicothe FFA Chapter participated in the Northwest District Ag Contest. The results are as follows: Agriculture Mechanics 10th place - Justin Jones, Justin Lewis, Clark Morris, Colton Reeter; Agronomy 22nd place - James Sedgwick, Zach Hamil, Lilly Scott; Dairy Foods 25th place - Tucker Jones, Anthony Peniston, Logan Wilson; Dairy Cattle 13th place - Maddie Boyles, Jordan Hall, Travis Henry, John Roney; Entomology 20th place - Hunter Brown, Dylan Proctor, Alexa Wheelbarger, Vanessa Wheelbarger; Farm Management 5th place (state) - John Davis, Cassie Reid, Stephen Cook, Lauren Dietzschold (seventh high individual), Maycee Hoover (Alt); Floriculture 28th place - Keara Hopper, Sarah Johnson, Sierra Midgett; Forestry 18th place - Daniel Nowland, Kenyon Spainhour, Tucker Jones; Horses 6th place - Devinn Ashford, Lara Hopper (Alt), Dani Moore, Mindi Prindle, Tanner Thompson; Livestock 9th place - Clark Allen, Kelton Diggs, Kayla McCullough, Michaela Simmer, Terrance Smith (Alt), Cassie Summers (Alt); Meats 19th place - Lynzie Colvin, Matt Goll, Hannah Meyers, Brooklyn Reed; Nursery/Landscape 17th place - Caela Ashford, Taylor Daly, Kaitlyn Garr, Sarah Hussey. The teams that qualified will participate at state contest on April 14th and 15th, in Columbia, MO. The Chillicothe FFA fielded 15 teams and 4 speaker at District Agriculture and FFA Career Development Events on March 30 and April 1. 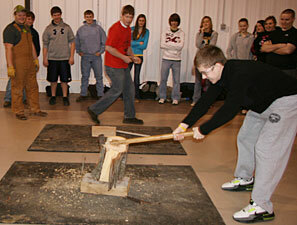 A total of 64 students competed from the Chillicothe FFA. The career development events were held at Northwest Missouri State University with 325 teams consisting of nearly 1350 students from 49 different schools competed this year. 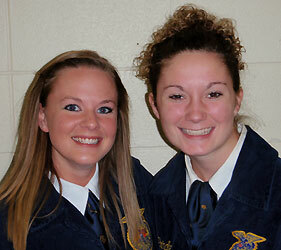 Local FFA members brought home one 10th place or higher honors. 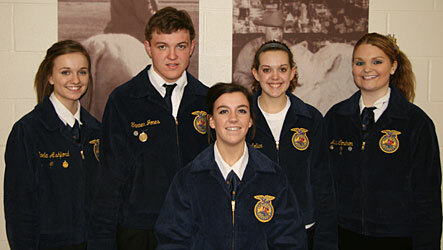 Chillicothe FFA qualified four teams and three speakers for State FFA Convention. The convention is to be held on the campus of the University of Missouri on April 14 & 15, 2010 in Columbia, MO. 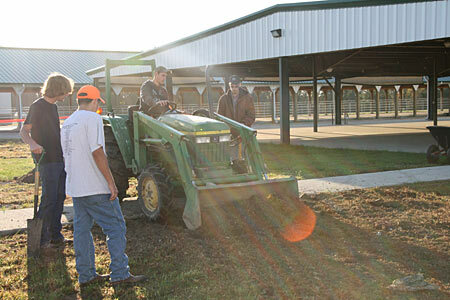 The local chapter is part of the Agricultural Education Program at the Grand River Technical School and is composed of students from Bosworth, Chillicothe, and Southwest high schools. 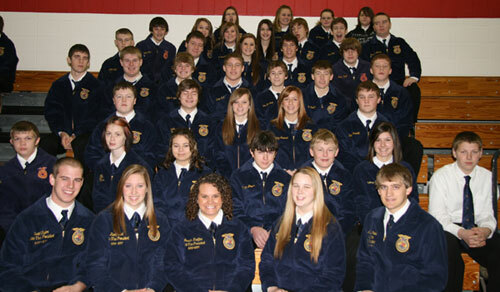 On March 23, 2011, the Chillicothe FFA Chapter participated in the Area II FFA Contest. The speaking results are: Creed Speakers: Quinten Lewis - Alternate and gold, Elizabeth Warren - 1st and gold; Prepared Public Speaking Division I Speaker: Tucker Jones - Alternate and gold; Prepared Public Speaking Division II Speakers: Caela Ashford - 1st and gold, Tanner Jones - 2nd and gold; Advanced Prepared Public Speaking: Daniel Nowland - silver, Jennifer Waits - silver; Extemporaneous Speaking: Haley Thompson - 3rd and gold; FFA books Completed Ownership: Gabe Jeffries - gold; Completed Placement: Connor Ruoff - gold ; Beginning Ownership: Maggie Graves - 1st and gold; Beginning Placement: Kayla Riddle - gold; Scrapbook: Carley Anderson, Caela Ashford, Madi Condron, Olivia Hays, Jordan Huddleston, Tanner Jones, Cyrsten Lollar, and Lizzie McCoy - 3rd and gold; Parliamentary Procedure team: Madi Condron, Jordan Huddleston, Bridgett Kieffer, Cyrsten Lollar, Lizzie McCoy, Brooke McCulley (Alt), and Blake Rasmussen - 1st place and a gold. Those teams and individuals receiving 3rd place or higher will proceed to District competition March 30, 2011. Students from the Ag Science I classes at the Litton Agriculture Education Center had a hands-on learning experience at the Litton Agri-Science Learning Center on March 22, 2011. The students learned about animal reproduction in class and then got to experience the real thing in person. A young pig developed a testicular rupture that needed to be corrected. A local vet, Dr. Clark Gwin, was called to correct the problem. Students observed the operation on the pig while Dr. Gwin explained what he was doing and answered student questions as well. The young pig is the SAE project of Jordan Hall a member of the Chillicothe FFA Chapter. The pigs are being housed at the Litton Agri-Science Learning Center. 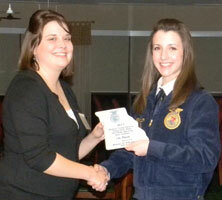 Pictured - Haley Thompson receives the plaque from Brittany Wilbanks, State YF Secretary. On February 19, 2011, at the Missouri Young Farmer/Young Farm Wives State Convention, Haley Thompson of the Chillicothe FFA chapter won first place in the FFA speech contest. The speech contest consists of writing a 6-8 minute speech, answering 5 minutes of questions regarding your speech, and then delivering the winning speech at the convention banquet. Congratulations to Haley and her accomplishment. On March 9, 2011, the Chillicothe FFA Chapter held their local speaking contest in order to determine who the chapter will send to the Area 2 FFA Contest being held March 23, 2011 in Gallatin. Also, we selected the Chillicothe candidates to send to Area and State Officer Interviews. Mindi Prindle, daughter of Vincent Prindle and Lisa Prindle, was Chillicothe's representative for an Area II officer. Mindi was selected as the Area II FFA 2nd Vice President. Carrie Boon, daughter of Mike and Elizabeth Boon, was Chillicothe's representative for Area II State Officer Candidate. Results are listed below. 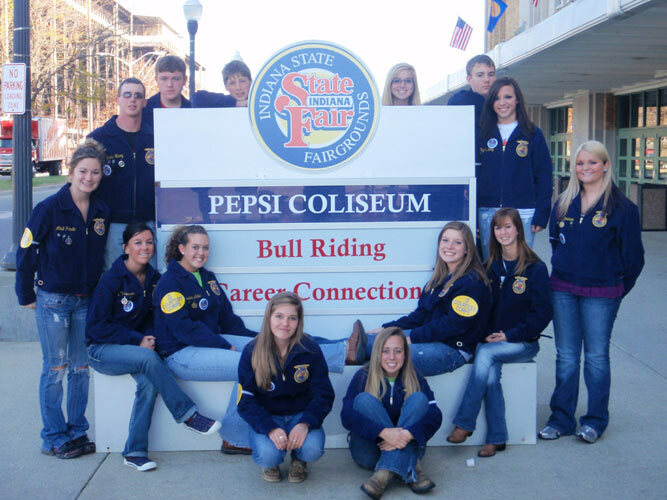 On March 2, 2011, it was announced that 11 members of the Chillicothe FFA will receive their State FFA Degree in Columbia, Missouri, on April 15, 2011. Before receiving this degree, they were required to meet a number of qualifications and fill out an application that followed their SAE and leadership skills. Those from our chapter who received the State FFA Degree include: Cheyenne Bannan daughter of Gary and Carmelia Bannan, Carrie Boon daughter of Mike and Elizabeth Boon, Stephen Cook son of Don and Cindy Cook, John Davis son of Bret and Darla Davis, Lauren Dietzschold daughter of Keith and Linda Dietzschold, Justin Haddakin son of Tom and Chondra Tipton, Maycee Hoover daughter of Kimbra Mullenix & Mark Hoover, Marie McMahan daughter of Les and Kim McMahan, Clark Morris son of David and Cindy Morris, Colton Reeter son of Eric and Jennifer Reeter, and Cassie Reid daughter of Anita Reid and Jeff Reid. The following students received first place in the Area 2 proficiency award selection. These students have been sent to the state level to compete against fifteen other area contestants. 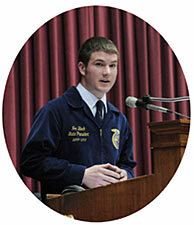 The state winner in each area will be selected at the Missouri FFA Convention held on April 14 and April 15, 2011. Daniel Nowland - Emerging Agricultural Technology: Involves students gaining experience in new and emerging agricultural technologies, such as agri-science. John Davis - Forage Production: Using best management practices available to efficiently produce and market crops for forage such as: alfalfa, clover, brome grass, orchard grass, grain forages, silages, and pastures. Tanner Jones - Fruit Production: Using the best management practices available to efficiently produce and market crops for fruit such as berries, stone fruits, pome fruits, citrus fruits, nuts, grapes, and common fruits. Colton Reeter - Turf Grass Management: Typically involves the planting and maintaining of turf for outdoor beautification, providing a lawn-mowing service, improvement of recreational areas, and golf course management. Tanner Thompson - Vegetable Production: Using the best management practices available to efficiently produce and market crops such as beans, potatoes, pumpkins, sweet corn, tomatoes, onions, zucchini, all canning vegetables, and all common garden vegetables. 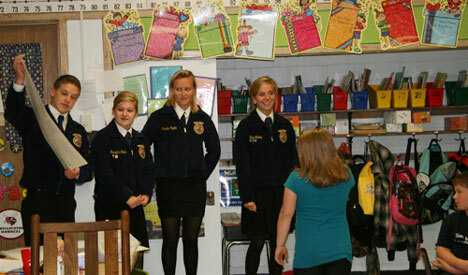 On February 24, 2011, the Chillicothe FFA Chapter held their Career Day in honor of National FFA Week. Area business people were asked to come in and speak with the students regarding their own FFA experience as well as their current agriculture career. The speakers were Megan Jennings - Monsanto, Janet Adkison - KMZU Radio, Jared Thomas - Chanel Seed, and Allen Jeffries - Sydenstricker. These individuals spoke to the students at the Litton Agriculture Education Center to show them what FFA can help you accomplish as well as the different types of careers the agriculture field encompasses. 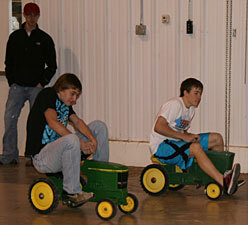 Students from the Chillicothe FFA Chapter participate in the annual Ag Olympics in celebration of National FFA Week. Students select a four-person relay team to compete. The sections of the relay are the tractor tire roll, pedal tractor race, hammering a nail, caring hay bales, and splitting wood. JEFFERSON CITY - Tuesday, February 15, 2011 the State FFA Officers of Missouri made a visit to the State Capitol. Jon Black, State President, gave an address before the full House in session. Jon is the son of Rusty and Karie Black of Chillicothe and is a member of the Chillicothe FFA Chapter. Prior to Jon addressing the House, Jon, parents Rusty and Karie, and Keith Dietzschold (Chillicothe Ag instructor) stopped and visited with Rep. Mike Lair. 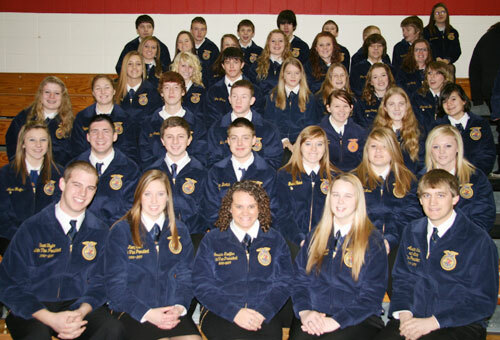 On Wednesday, January 5, 2011, 78 Chillicothe FFA Freshman attended the Northwest District Greenhand Motivational Conference at the North Central Missouri College Campus in Trenton, Missouri. Through interactive workshops and skits, Missouri State FFA Officers used the FFA version of the "Survivor" as the theme to motivate Greenhands, who are first year FFA members. They helped the new agriculture students set goals for their education, careers and FFA experiences. MFA Incorporated sponsored this event in coordination with NCMC. State Officers that put on the conference are seating in the front row of the pictures from L to R: Quaid Taylor, Kerry Elbel, Jessica Kueffer, Michelle Johnson, and Austin Steele. 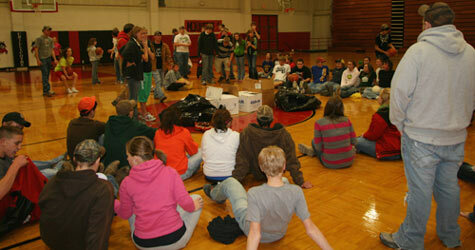 On December 1, 2010, the Chillicothe FFA held their annual Christmas Party at the Chillicothe Middle School. This party represents a reward for members on an excellent Barnwarming this year as well as a time for fellowship. The members enjoyed dinner and then moved into the field house for some games. Members chose from the following activities: basketball, dodge ball, volleyball, watching movies, or they participated in other activities. The students also held a canned food drive and collected 11 boxes of canned food items. There were approximately 115 members present and everyone seemed to enjoy the evening. The Chillicothe FFA held their annual food drive this December. Students collected canned food items for the drive and compiled them at the December FFA meeting, which was held December 1, 2010. The canned food items were then delivered to the local Salvation Army. The chapter collected eleven boxes of food to donate to the Salvation Army. 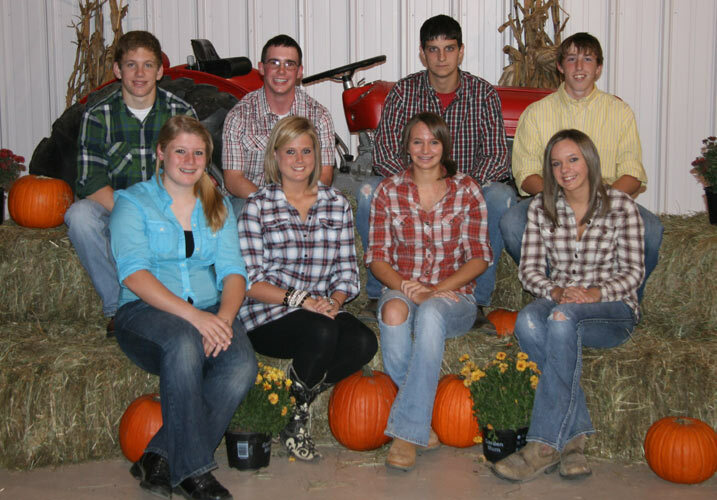 On November 3, 2010, Chillicothe FFA students participated in the Area 2 Fall Speaking Contest in Gallatin. Chelsea Mann competed in the Missouri Farm Bureau Contest, Tanner Jones competed in the Missouri Pork Producers Contest, Jennifer Waits competed in the Missouri Sheep Producers Contest, Hannah Meyers competed in the Missouri Soil and Water, and Haley Thompson competed in the Missouri Young Farmers speech contest. Three of the six members qualified to move on to the district competition: Haley, Jennifer, and Tanner. At the Northwest District competition, held on November 17, 2010 in Cameron; Tanner Jones received second place in the Missouri Pork Producers Contest, Jennifer Waits received fourth in the Missouri Sheep Producers competition, and Haley Thompson received first in the Missouri Young Farmers contest. Haley will move on to the state competition later this year. Indianapolis, Indiana - Juliane Beck (Sykes), Shane Cooper, Tyler Dietzschold, Meredith Jones, Angela Quick, Ben Radcliff, and Lance Williams, members of the Chillicothe FFA Chapter, recently received the American Degree. Earning the degree means Juliane, Shane, Tyler, Meredith, Angela, Ben, and Lance are of a select group of individuals to be recognized for years of academic and professional excellence. The honor was presented on October 23, 2010 at the 83rd National FFA Convention held in Indianapolis, Indiana. Pictured L to R: Meredith Jones, Lance Williams, Tyler Dietzschold, Shane Cooper, Ben Radcliff, and Juliane Beck (Sykes). Not Pictured: Angela Quick. Almost any event becomes more intriguing when viewed from behind the scenes. The 83rd National FFA Convention, which includes everything from arena stage events to the Day of Service and workshops for nearly 55,000 attendees, is no exception. It takes many volunteers to help make a convention of this magnitude a positive experience for all of its guests. This year, approximately 900 FFA members, including students from the Chillicothe FFA Chapter, formed the National FFA Courtesy Corps. The students viewed the convention from the other side - backstage - playing a crucial role in the events logistics. Local members participating in the National FFA Courtesy Corps were Carley Anderson, Lynzie Colvin, Madi Condron, Taylor Daly, Travis Henry, Jordan Huddleston, Tanner Jones, Cyrsten Lollar, Lizzie McCoy, Jake McKiddy, Dani Moore, Sydney Oden, Hope Peters, and Mindi Prindle. 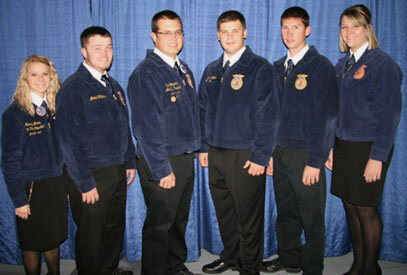 The 83rd National FFA Convention was held October 20-23, 2010 in Indianapolis, Indiana. "Participants in the National FFA Courtesy Corps provide valuable services for the overall convention operation," says National FFA Advisor Dr. Larry D. Case. "FFA gains a tremendous resource, and the participants gain wonderful volunteer experience and an insight into the planning and logistics necessary to ensure a safe and successful convention. They are key to our ability to create a premier leadership and educational event for nearly 55,000 guests." The National FFA Organization, formerly known as the Future Farmers of America, is a national youth organization of 523,309 student members - all preparing for leadership and careers in the science, business and technology of agriculture - as part of 7,358 local FFA chapters in all 50 states, Puerto Rico and the Virgin Islands. The National FFA Organization changed to its present name in 1988, in recognition of the growth and diversity of agriculture and agricultural education. The FFA mission is to make a positive difference in the lives of students by developing their potential for premier leadership, personal growth and career success through agricultural education. Pictured, starting in the back middle, clockwise: Dani Moore, Jordan Huddleston, Taylor Daly, Madi Condron, Lynzie Colvin, Hope Peters, Lizzie McCoy, Sydney Oden, Cyrsten Lollar, Carley Anderson, Mindi Prindle, Travis Henry, Tanner Jones, Jake McKiddy. On October 20 through the 23, 14 members of the Chillicothe FFA Chapter attended the National FFA Convention in Indianapolis, IN. 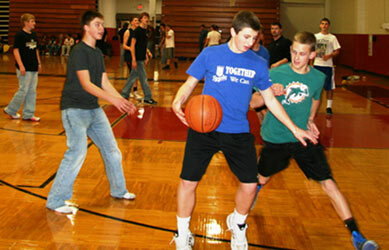 The students attended many activities while in Indianapolis. The students attended leadership sessions, the career show, college fair, and convention session while at the convention hall. Students also attended a session were the speaker was Josh Shipp, a concert featuring Lady Antebellum, and got an opportunity to have a little fun riding go karts. Local members that attended the convention were Carley Anderson, Lynzie Colvin, Madi Condron, Taylor Daly, Travis Henry, Jordan Huddleston, Tanner Jones, Cyrsten Lollar, Lizzie McCoy, Jake McKiddy, Dani Moore, Sydney Oden, Hope Peters, and Mindi Prindle. Pictured Front to Back L to R: Lizzie McCoy, Hope Peters, Tanner Jones, Madi Condron, Lynzie Colvin, Jake McKiddy, Jordan Huddleston, Travis Henry, Carley Anderson, Sydney Oden, Taylor Daly, Mindi Prindle, Cyrsten Lollar, Dani Moore. 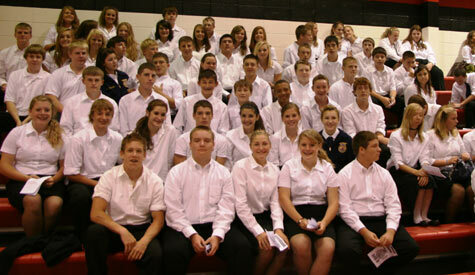 On October 13, 2010, the Chillicothe FFA held their annual Parents' Night, where 327 members and guest attended. This event is to help welcome the first year FFA member and their parents to our organization, as well as showcase some of our members' talents. The evening began with FFA opening ceremonies followed by a welcome given by Dr. Linda Gray Smith, Chillicothe R-II Schools Superintendent. 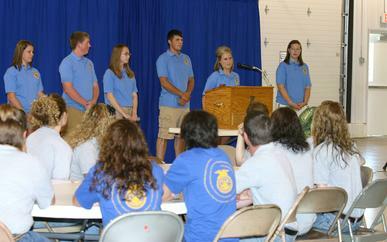 The Chillicothe FFA Chapter officers and Chillicothe FFA Assistant Officers presented the program. The program consisted of the Greenhand FFA degree ceremony, Chapter FFA degree ceremony, skit presented by the Chillicothe FFA Chapter Officers, a commercial break presented by the Chillicothe FFA Assistant Officers, as well as 2 creeds presented by Greenhands. The Ag Power and Structures and Ag Construction II classes in the agricultural department at the Litton Agriculture Education Center are assisting in the construction of new concrete around the Litton Agriculture Campus. The concrete being put in is a new sidewalk on the east side of the Litton Agriculture Education Center, a floor in the Livingston County 4-H & FFA Fair building, and new handicap ramps to the bathrooms in the Livingston County 4-H & FFA building. The new concrete being put in will be used all year round. At this time the students are putting up the forms in order to pour the concrete in the near future. The skills that the students are learning include concrete construction, surveying, and work ethic. The skills learned will hopefully help them in some area around their own homes. The Litton Agriculture Campus was created for the Livingston County youth with an interest in livestock that did not have the facilities of their own. Keith Dietzschold and the classes hope to have the projects done before winter. 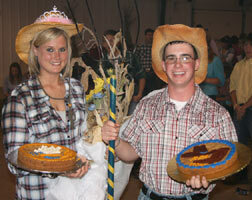 On Saturday, October 30, 2010, the Chillicothe FFA held its annual Barnwarming festivities. These festivities included a dance, games, a hay tunnel, and the coronation ceremony. This year's 2010 Barnwarming King and Queen are Travis Henry and Lauren Dietzschold. The Senior class candidates - Lauren Dietzschold (daughter of Keith and Linda Dietzschold) and Travis Henry (son of Melinda Henry) - raised $6,074.00 with an average of $233.61/person; Freshmen - Paige Peters (daughter of Bob and Berta Peters) and Alan Kline (son of Brent and Jill Kline) - raised $6,212.33 with and average of $73.08/person; Sophomores - Keara Hopper (daughter of Mark and Joan Hopper) and Bobby Peniston (son of Bob & Ashley Peniston and Tim Wallace & Cathy Peniston) - raised $3,457.50 with and average of $65.35/person; Juniors - Lara Hopper (daughter of Mark and Joan Hopper) and Kayleb Berry (son of David and Kristy Berry) - raised $3,525.17 with an average of $62.95/person. The chapter raised $19,269.00 this year for the chapter's operations that average out to $87.58/member. We would like to thank all the member of the community for the long time support of our organization. The candidates are as follows: Seniors, Lauren Dietzschold (daughter of Keith and Linda Dietzschold) and Travis Henry (son of Melinda Henry); Juniors, Lara Hopper (daughter of Mark and Joan Hopper) and Kayleb Berry (son of David and Kristy Berry); Sophomores, Keara Hopper (daughter of Mark and Joan Hopper) and Bobby Peniston (son of Bob & Ashley Peniston and Tim Wallace & Cathy Peniston); Freshmen, Paige Peters (daughter of Bob and Berta Peters) and Alan Kline (son of Brent and Jill Kline). The chapter has set a goal to raise $19,000 this year for chapter operations. If you have any type of job please give an FFA member a call or call one of the advisors at the Litton Agriculture Campus at 646-3131. FFA members Kerrigann Cosgrove (left, with trash bag) and Katlin Hightower raked leaves and cleaned gutters for Kathy Jennings Monday evening. FFA members are participating in acts of service for area residents to raise money for their FFA chapter and the annual Barnwarming, which is this Saturday. On September 15, 2010, 85 Greenhands of the Chillicothe FFA Chapter attended the Area II Greenhand Initiation Ceremony in Gallatin, Missouri. The Area II officer team, lead by President Lauren Dietzschold of the Chillicothe FFA Chapter, conducted the initiation. During the initiation, the Greenhands listened to the 2010 Area Creed speaker, Kate Lowry, recite the creed, watch a slideshow featuring Area II Greenhands, listened to the National FFA Officer, Randa Braune, speak, and were presented their Greenhand pins during the Greenhand Ceremony. Chillicothe FFA members enjoyed a great summer of exhibiting for their projects this summer. Some members are shown holding plaques of various awards individual members and the entire chapter received over the summer. The Chillicothe FFA Chapter received the Swine Herdsmanship, 2nd in the Swine Sweepstakes, 1st in the Poultry Sweepstakes, 6th in the Goat Sweepstakes, 5th in the Beef Sweepstakes, 20th in the Sheep Sweepstakes and the Governor's Livestock Plaque, which is the Best (1st) FFA Livestock Exhibit (for the third year in a row) Award during the 2010 Missouri State Fair. One of the six National FFA Organization's officers, Randa Braune, western region vice president, talks to a group of Chillicothe R-2 ag students this morning at the Litton Agricultural Education Building at the Litton Agri-Science Learning Center. She talked about the FFA organization and conducted leadership games with the students. 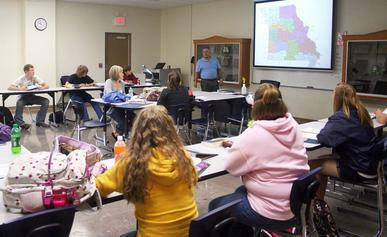 Rusty Black, Chillicothe R-2 FFA ag instructor goes over FFA Review this morning in the Litton Agriculture Education Center, located at the Litton Agri-Science Learning Center. 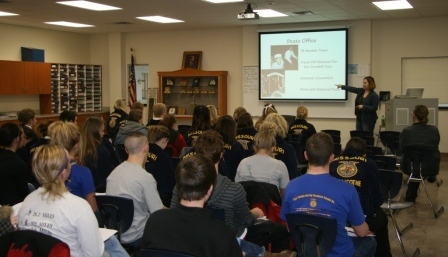 During FFA Review, ag students are versed in general information about FFA, including the state's FFA chapters and various state and area officers. Students enrolled in the Chillicothe R-2 ag program work on constructing lockers in the shop area of the new Litton Agricultural Educational Center this morning as part of their ag construction class. All students enrolled in agriculture classes are members of the Chillicothe FFA, which has a whopping 250 member roster this year - the largest-ever. 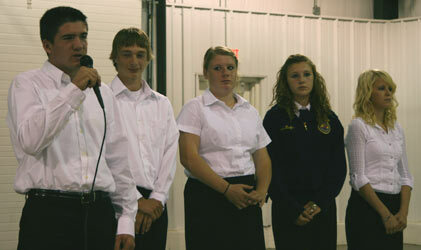 The Chillicothe FFA Chapter held their annual August meeting Wednesday night, August 25, 2010. The meeting was held at the Chillicothe High School commons and served as a new member orientation. FFA advisors report there are 100 new members in the local chapter, and there were approximately 320 parents and FFA members at the meeting. Attendees enjoyed the FFA opening ceremonies presented by the Chapter Officers. The group was then broken into two groups, one with parents and one with students. The parents were given an overview of what to expect from being an FFA parent. The student group participated in mixers, games, and a question/answer session with the officers. Students in the Chillicothe FFA Chapter are from Chillicothe, Bosworth, and Southwest. "Advancing New Frontiers" designed to guide Freshmen and Sophomores who want to learn the basics of self-discovery and understanding their leadership potential. "Starting the Expedition Process" designed to help Juniors and Seniors create an advanced plan for lasting impact on the world through utilizing personal leadership traits and healthy relationships to make their goals a reality. Lauren Dietzschold (second from left), the Area 2 FFA president, welcomes those gathered for the annual Area FFA workshop at the Litton Agri-Science Learning Center. There were 135 FFA members from 22 schools attending the event, which also featured remarks from State FFA President Jon Black. On Tuesday, August 3, 2010 the Missouri Area II Officers held a workshop for chapter officers at the Mervin Jenkins Building at the Livingston County Fair Grounds. The workshop focused on communication skills, teamwork, and leadership. The workshop consisted of the Area II Officers conducting opening ceremonies then area chapters competed in both a rituals contest, best-dressed, most creative, and Ag Olympics competitions. The rituals contest is to see which officer team can present the official FFA opening ceremonies with the fewest flaws. The best-dressed contest is to see with chapter officer team was dress the best as a team. The most creative was given to the officer team with the most creative attire. 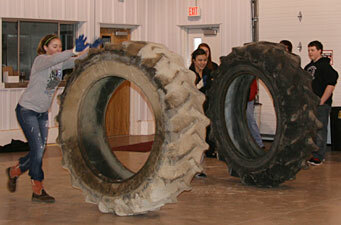 The Ag Olympics was which officer team could complete the teamwork activities the most efficiently and quickly. Results of the competitions: Rituals - 1st place Chillicothe, 2nd place Princeton, 3rd place Jamesport; Creative Dress - 1st place Winston, 2nd place Jamesport, 3rd place Trenton; Best Dressed - 1st place Galt, 2nd place Jamesport, 3rd place Gallatin; Ag Olympics - 1st place Chillicothe, 2nd place North Harrison, 3rd place Tina. The workshop session covered the topics of communication and teamwork. The Area II officers planned and conducted the event. FEC was the generous sponsor of this event. 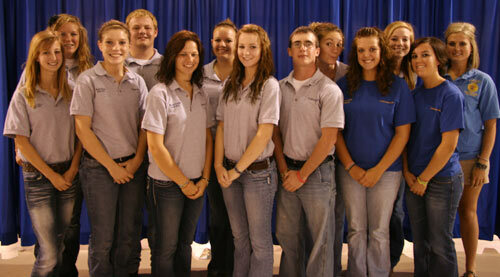 On June 5, 2010 the Livingston County 4-H & FFA Fairgrounds-Jenkins Expo Building hosted two swine shows. There were approximately 320 head of hogs shown at this event. On Saturday morning, the show was sponsored by the Chillicothe FFA Alumni. There were approximately 230 head of hogs at this show. The sponsors of this show were American Family-Janet McCauslin, Barnes Baker Motors, Brammer Show Pigs, BTC Bank, Chillicothe Animal Hospital, Chillicothe State Bank, Chula Farmers Coop, Cunningham Plumbing Co., Davis Livestock, Dean Machinery, FEC, Grand River Technical School, Hoffman-Reed Inc., Hutchinson & Co., J.R. Reid Show Pigs, KMZU Radio, Livingston TV & Appliance, MFA Agri-Service, Pioneer HiBred Seed, Rudasill Farms LLC, Simms Show Pigs, Sullivan Show Supplies, T & R Soil Service, TLD Livestock, Trans Ova Genetics, Williams Farms, Wolf Farms, and Wolf Brothers. The results of the show were Supreme Gilt went to Troy Sloan, Reserve Supreme Gilt went to Brent Boland, Supreme Barrow went to Bailey Kemp, and Reserve Supreme Barrow went to Carter Ward. Showmanship results are Champion Novice Showmanship went to Cole Murphy, Reserve Novice Showmanship went to Chase Schlup, Champion Junior Showmanship went to Cooper Sutter, Reserve Junior Showmanship went to Johnny Johnson, Champion Intermediate Showmanship went to Olivia Loges, Reserve Intermediate Showmanship went to Austin Boland, Champion Senior Showmanship went to Bailey Pope, and Reserve Senior Showmanship went to Morgan Fuehring. The Saturday night show was the Missouri Elite Breed Spectacular. This show was sponsored by Certified Pedigree Swine, Chillicothe State Bank, Croy Show Pigs, Davis Livestock, Dimond J Livestock, Gail and Garett Reid Families, J.R. Reid Show Pigs, National Swine Registry, Oram Family Spot, Randy Derr, Robinson Genetics, Stein and Stewart Genetics, Travel Tyme/Pap�s Primitive , and Whitehead Spots. The results are Champion Berkshire Gilt went to Carson Price, Reserve Champion Berkshire Gilt went to Austin Boland, Champion Chester Gilt went to Victoria Hinton, Reserve Champion Chester Gilt went to Bailey Pope, Champion Duroc Gilt went to Abby Gass, Reserve Champion Duroc Gilt went to Noah Gamm, Champion Hampshire Gilt went to Johnny Johnson, Reserve Champion Hampshire Gilt went to Taylor McGaugh, Champion Poland Gilt went to Cole Murphy, Reserve Champion Poland Gilt went to Abby Burns, Champion Spot Gilt went to Taylor McGaugh, Reserve Spot Gilt went to Keagan Brewer, Champion Yorkshire Gilt went to Bailey Pope, Reserve Champion Yorkshire Gilt went to Troy Sloan, Champion Berkshire Barrow went to Cooper Sutter, Reserve Champion Berkshire Barrow went to Hannah Viets, Champion Chester Barrow went to Brent Boland, Reserve Champion Chester Barrow went to Alexandria Minklen, Champion Duroc Barrow went to Bryana Binkley, Reserve Champion Duroc Barrow went to Shelby Sutter, Champion Hampshire Barrow went to Gracie Deters, Reserve Champion Hampshire Barrow went to Cooper Sutter, Champion Poland Barrow went to Victoria Hinston, Reserve Champion Poland Barrow went to Tanner Thompson, Champion Spot Barrow went to Quinten Lewis, Reserve Spot Barrow went to Morgan Fuehring, Champion Yorkshire Barrow went to Zach Craven, and Reserve Champion Yorkshire Barrow went to Kelton Diggs. Showmanship results are Champion Novice Showmanship went to Cole Murphy, Reserve Novice Showmanship went to Camryn Schlup, Champion Junior Showmanship went to Gabrielle Deters, Reserve Junior Showmanship went to Dallas Kleiboeker, Champion Intermediate Showmanship went to Quinten Lewis, Reserve Intermediate Showmanship went to Bryana Binkley, Champion Senior Showmanship went to Bailey Pope, and Reserve Senior Showmanship went to Jesse Birkenholz. 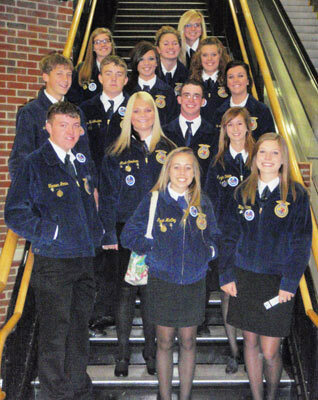 On June 3, 2010 the Chapter and Assistant officers from the Chillicothe FFA Chapter attended the MO FFA LEAD Conference on the NCMC Campus in Trenton, Missouri. 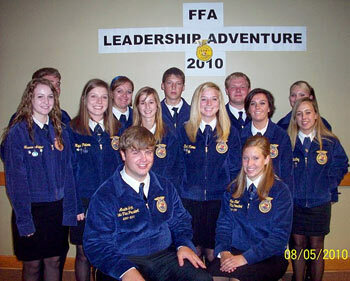 The conference was sponsored by the FFA Leadership Fund. The Learn, Educate, Advance Develop (LEAD) conference brings officers and their advisors together as they start off a new year as a new officer team. The teams set goals and officer codes of conduct/expectations, develop a program of activities and calendar of activities, and explore how to work with the different personalities on their team.